"aACE is a powerful business management solution for small and mid-sized enterprises. aACE links accounting, CRM, ERP, and more, providing a 360º view of your company." aACE Software scored 87/100 in the Business Management category. This is based on user satisfaction (100/100), press buzz (26/100), recent user trends (falling), and other relevant information on aACE Software gathered from around the web. aACE is a software solutions provider that caters to small- and medium-sized businesses, offering both on-premise and cloud-based business management solutions. Companies and organizations that require a robust platform with innovative and highly efficient tools to help centralize their day-to-day business process will find the aACE business suite a nifty and very functional product. The software solution caters to a variety of business types across multiple industries, ranging from construction to manufacturing and wholesale distribution. The aACE product has quite a few offerings, including a built-in customer relationship management (CRM) solution, accounting software and enterprise resource planning (ERP). The platform also comes with mobile apps and seamless integration capabilities with third-party programs and tools for e-commerce, email marketing, shipping services and payment processing. And the best thing about aACE business management software solution is that it can be utilized as is (out-of-the-box) or it can be custom-fitted to match the specific needs of any growing business, where users have the freedom to manage multiple teams and gain total control over their organization’s day-to-day processes. At its core, aACE is a highly diverse platform that combines the functions of enterprise resource planning, customer relationship management and accounting software solutions. Using these key systems, users are able to effectively manage the day-to-day activities of their organization from just a single comprehensive platform. One of the things that the aACE business management software solution is great at is keeping all of its consistency across the board. As users perform tasks and interact with the different sections and tools of the platform, they can trust that whatever data they access, the information they get from the dashboard and the figures provided by the system are accurate and up-to-date. The aACE business management software solution comes with a variety of modules, including an accounting module, CRM, ERP, inventory management, production management and order management. In addition to those six core modules, the platform also offers other features like shipping and receiving management, scheduling and calendar management. The accounting module provides users with a bunch of practical and very familiar tools such as general ledger, lead tracking and balance sheet capabilities. The solution allows you to create budgets, send out invoices, manage all your accounts and effortlessly access sales tax codes for company orders. The customer relationship management or CRM module allows users to manage relationships with their vendors and partners. It also provides sales monitoring capabilities, quotes and business performance tracking. And like any other CRM solution in the market, it lets you manage your contacts, keep track of client activity, create sales orders and even send out email marketing materials to your customers. The enterprise resource planning or ERP module integrates seamlessly with existing sales, business operations and accounting tools. The smart ERP system gathers all crucial data in order to generate up-to-date forecasts on finance, HR and resource needs, among other things. And when you incorporate all that into the aACE Business Suite, along with its various automation tools, you end up with a pretty smart and innovative business management software solution. aACEsoft offers affordable enterprise-level tools and applications designed for small- and mid-sized businesses seeking to streamline their business processes. The aACE business management software solution is available for both Mac and PC and provides users with the flexibility and ease-of-use to make the necessary adjustments and changes to the platform in order to come up with a customized solution that meets the needs of their organization. Additionally, because aACE is an open platform, any developer can essentially integrate the software with other third-party solutions, with minimal cost, in order to provide a robust and fully-customized end-to-end solution for each individual company. The aACE Accounting program for both Mac and PC is a feature-rich accounting solution that is fully integrated with the CRM and ERP components of the software. aACE Accounting enables users to closely track a sale from the lead all the way to the balance sheet. The CRM module that comes with the aACE business management software solution is quite an impressive feature as well. It is a CRM solution designed for both Mac and PC and it provides users with a 360-degree view of their business relationships and partnerships. Resulting in more robust sales and quoting infrastructure. This is more than your typical CRM solution—the module can give you a complete insight into all your relationships, from your customers and contacts to vendors, suppliers and partners. Another module that is heavily emphasized in the design and functionality of aACEsoft is its ERP solution. The ERP software, which is also available for both Mac and PC, seamlessly integrates sales, operations and accounting. This is a flexible and comprehensive solution that allows users to increase their visibility, automate a number of workflows, minimize or eliminate altogether duplicate data entries and reduce man-made errors. You can effectively increase the speed and accuracy of your day-to-day operations with this module in your business management platform. aACE business management software is already a pretty comprehensive and diverse suite for all types of businesses. However, it is still possible to extend its capabilities a bit further through seamless integrations. aACE can be integrated with ACH payment processing, credit card processing, shipping, email marketing, e-commerce and so much more. With the aACE platform, you can empower your mobile workforce through the aACE mobile apps specifically designed for iOS devices, i.e. the iPad and the iPhone. Currently, the apps include time-clock, CRM tools, inventory and more. There are two licensing options available for the aACE software solution. There’s the Complete Edition for companies looking for a straightforward, out-of-the-box hosted solution and then there’s the Enterprise Edition for organizations that want a solution that specifically tailored to their needs and gives them complete control and flexibility. The Complete Edition licensing option starts at a reasonable $79 per user per month with a $199 monthly hosting fee. It is cloud-hosted by aACE, has limited customization and complementary automated updates. Complete Edition is good for a minimum of five users. The Enterprise Edition, on the other hand, is specifically designed for those who want total control and flexibility from their business management software solution. The licensing option starts at $22,500 for a minimum of 10 users. Customers will have the option between cloud and on-premise hosting. The solution is completely customizable and there’s a 20% annual maintenance. Interested parties can contact aACE representatives directly to request a demo. And for more information about the software solution, you may visit their official website. All in all, aACE business management software solution is a robust and easy to use platform that is suited for small- and medium-sized businesses, as well as large enterprises due to its flexibility and scalability. So if you’re looking for a business management solution that puts an emphasis on accounting, customer relation management (CRM) and enterprise resource planning (ERP), but caters to a wide variety of business processes as well, then aACEsoft might be the solution for you. Who are the main user groups of aACE Software? Does aACE Software integrate with any other apps? What platforms does aACE Software support? Does aACE Software offer multi-user capability (e.g. teams)? Does aACE Software offer guides, tutorials and or customer support? What is aACE Software generally used for? What are some applications aACE Software is commonly used in tandem with? 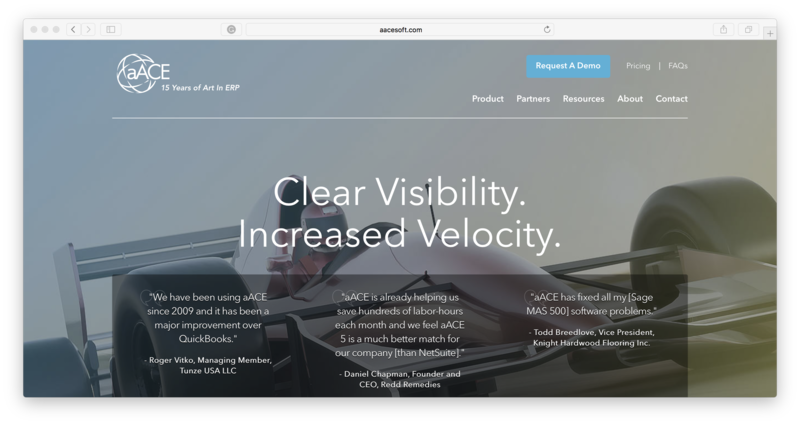 Does aACE Software offer an API?